Home>Music> Lil Xan Announces Twitter Hiatus: "This App Spreads Negativity & Evil"
It seems the negative pressure has come to a boiling for Lil Xan. About an hour ago, Xan announcing his looming exit from the Twitterverse. It has been an easy going for the Cali rapper. Although his constant buzz has presented him with financial rewards, his new G truck a pretty shiny example of something working in his favor. He booked a tour, released an album, and reportedly dialed back his addiction to pain killers. For these commendable acts, I offer him a salute akin to a Cowboy raising his Stetson. The landscape is far more jagged on the internet, his haters forming a rough interior presence. These haters for all their worth, have become adept at tackling the many sore spots or easy targets who present themselves through a series of vulnerabilities. This afternoon, Lil Xan was exposed for those very weak points. 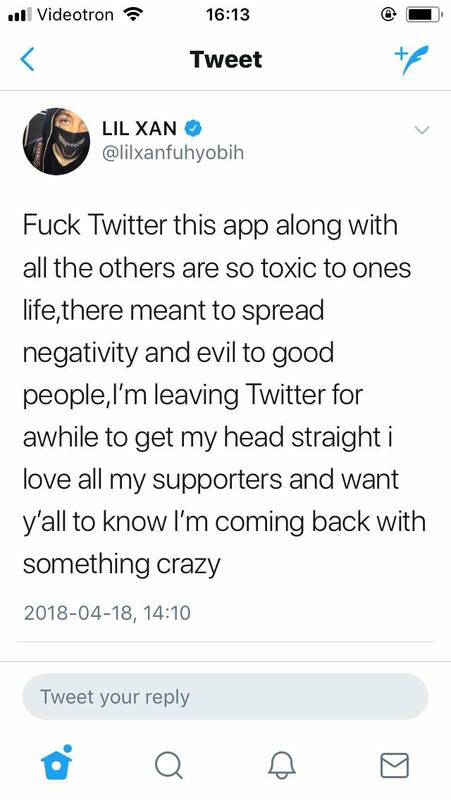 He tweeted out in response to the constant stream of negativity he faces, insisting that Twitter and other apps like it are especially toxic. He further explained his condemnation of Twitter by claiming it "spread negativity and evil to good people," Lil Xan's reliance on a good vs evil explanation of the universe, in my view, sums up his 'Simple Simon' rhyme scheme. He promises to return to Twitter & Music after a short rest period. Godspeed Lil Xanax. El-P Lands Gig Scoring Al Capone Biopic "Fonzo"
Ty Dolla $ign Compares Beyonce To Michael Jackson: "She Got It Going"
MUSIC Lil Xan Announces Twitter Hiatus: "This App Spreads Negativity & Evil"